ince the days of Gable and Lombard, when rumors of their stolen visits to the Yucca Loma Ranch were whispered in Hollywood, Apple Valley has been known as “A Better Way of Life.” People who settle here do so by choice and not out of necessity. They are attracted by the clean air of the High Desert, the hometown feeling of the area and to Apple Valley in particular — it is a wonderful place to locate a business and raise a family. FREE LOCAL NEXT DAY DELIVERY. s early as the late 18th century, explorers began trekking the valley along the Mojave River. The Spanish missionary Father Francisco Garces, the explorer Jedediah Smith and government topographer John C. Fremont were among the earliest non-natives to the area, but it was the discovery of silver and gold that brought large numbers of settlers. quoted as saying, “There were apples being grown along the river, but not by the ‘ton,’ so I just called it Apple Valley.” Mrs. Poates’ efforts were later overwhelmed by the federal government, which opened thousands of acres to homesteaders shortly after the dawn of the 20th century. Santa Fe Railway began to lay double trackage to serve the anticipated needs of the area. On April 17, 1917, the United States entered World War I. Soon thereafter, young farmers, homesteaders, dambuilders and cowhands began to march off to fight instead of developing the area. The years following World War I brought many changes that affected the area’s residents. The orchards suffered from a devastating fungus, the cost of operating electricity-driven water pumps increased and apples and other fruits from the Pacific Northwest arrived in California markets. The area witnessed many struggles between the original inhabitants and the later settlers. In January 1867, the last Native American battle was fought a few miles east of what is now Apple Valley, at a place called Chimney Rock. Today, people of many ethnic cultures live together in the peaceful surroundings of the valley, and the legacy of these cultures is evident throughout the area. Chimney Rock is marked by a state registered historical monument, and the old mine shafts can still be seen in the surrounding hills. Many orchards died, and the valley returned to its original landscape of quiet desert beauty. Finally (from 194446), frosts, heat and hail fell upon the surviving orchards. For the next seven years, firewood — the only thing growers had left to sell — was carried across Cajon Pass for burning in the fireplaces of Los Angeles. In 1945, Newton T. Bass and Bernard (Bud) J. Westlund, oil field wildcatters, became the area’s primary developers. Drilling in the Apple Valley area, Bass found something even more valuable than the oil he was searching for: water. Bass and Westlund bought 20,000 acres east of Victorville from the Union Pacific Railroad and decided to develop a community. The men pioneered land development, turning the acreage that they bought into a recreational and retirement “bedroom” community. This development has made Apple Valley one of the desert’s most prosperous areas. IF YOU LIKE WHAT WE’RE DOING, TELL A FRIEND. IF YOU DONT LIKE WHAT WE’RE DOING TELL US. 760-843-1938 By consistently maintaining its agency goals, Massey Insurance is able to provide an array of service for its clients since 1980.
party up the Colorado River to Needles and across the desert to the Victor Valley in 1776. Explorer John Fremont traveled throughout much of the territory. In 1844, he returned to Washington after traveling across the Cajon Pass and along the “Mohahve” River. Eventually, the railroad came to Victor Valley. Overcoming a difficult task of engineering, the first track climbed and wound over Cajon Pass from San Bernardino to arrive in 1883. Built by the California Southern Railroad (later AT&SF) under the supervision of L. N. Victor, the line reached the Atlantic & Pacific (UPRR) junction at Barstow/Daggett in 1885. In 1923, the road crossing the pass was paved for the first time. America, and, as the facilities become more congested in Southern California, business and industry are turning their attention northward. Less congestion means faster movement of goods, and savings to companies who have to compete in the national and international market. by a modern, well-coordinated highway system. Interstate 15 extends southward to San Diego, connecting with Interstate 10 and 215 and State Routes 60 and 91. Northbound, I-15 runs to Las Vegas, and connects with State Route 58 and Interstate 40. State Route 18 is the major northern east-west corridor in Apple Valley, and its proposed realignment — along with intermodal transportation facilities in Barstow (20 minutes) and San Bernardino (40 minutes) — will significantly enhance the region’s already formidable presence in the transportation of goods and services in and out of the Los Angeles basin. available at Apple Valley Airport include fuel, food, maintenance, charters, rentals and flight training. BUS: Victor Valley Transit Authority provides local bus services. Apple Valley is also served by the Greyhound Bus Lines at the Victorville Transit Center (16838 D St., Victorville). Charter bus service is also available. • Southern California Rail Complex, a planned 3,500-acre inter-modal rail and multi-modal complex including railserved facilities. • Southern California Logistics Centre, a 2,500-acre commercial and industrial complex totaling 60 million square feet of diverse development. • Southern California Logistics Airport, a 2,500-acre world-class aviation and air cargo facility serving domestic and international needs. artifacts can be viewed yearround, Wednesday through Sunday. Call (760) 252-6000 for more information. Calico Ghost Town is another historical site. Once a thriving silver mining community, it is now a great place to take the family. You can dine, be entertained, take a train ride, walk through a mine and watch cowboys shoot it out on Main Street. Call (760) 254-2122 for more information. California Route 66 Museum celebrates a time when the automobile was king. The museum includes artifacts of the famed Route 66, rotating exhibits and a permanent display of roadside attractions. Hulaville. Call (760) 951-0436 for more information. • High Desert’s largest conference/meeting space • 15,000FT2 flexible space, from 10-700 people • Relax and let our highly responsive team members oversee every detail. he early years of Apple Valley offered many entertainment and dining possibilities — a tradition that continues today. Probably the most famous dining and dance hall, The Branding Iron set the tone for unique entertainment in Apple Valley. While it no longer exists, the ideals of fun, great food and meeting your friends and neighbors in a relaxing atmosphere is still prevalent in our dining establishments today. Apple Valley offers a host of outstanding family run restaurants that reflect the pride of the owners. There are all kinds of choices, including steak houses, Italian, Mexican and American style. They are like old friends, offering great atmosphere and comfort. After dinner, you can see a nearby movie or watch a play. In the summer, you can catch a baseball game at the Stater Bros. Stadium or go dancing at one of the several local nightspots. Karaoke is popular in several pubs, and some of the local talent is outstanding. You can step into an Italian restaurant, seemingly right out of Brooklyn, where the owner has been known, on occasion, to sing a perfect rendition of Tony Bennett to his patrons. You can join the Country crowd and learn line dancing after your dinner of steak and baked potato. Taste the great margaritas and dip into great salsa at the neighborhood Mexican restaurant. Country cafés offer great hamburgers or fried chicken and mashed potatoes in a warm, friendly setting. You choose! Ashwood Golf Course make for a great day of golfing, regardless of the final score. For variety, the avid golfer can also try one of the other half dozen golf courses in neighboring communities, including Spring Valley Lake, Victorville Municipal Golf Course and the Hesperia Golf Course. Local fishing opportunities abound at the Jess Ranch trout farm, Hesperia Lakes and in the numerous local mountain lakes, providing relaxing fun for the entire family. golfers and celebrities have tried their hand at the Apple Valley Golf Course, including Lloyd Mangrum (1914-1973) who was ranked 10th on the all-time list of PGA tour wins at his induction into the World Golf Hall of Fame in 1998.
programs to excursions. A quarterly Recreation Activity Guide is mailed to residents to keep them apprised of the fun. Some of the classes offered through the department include painting, dancing, computers and even “Puppy Kindergarten.” A comprehensive pee-wee sports program teaches 3- to 5-year-olds the building blocks of sport skills and teamwork in a noncompetitive environment. Open rides and campfires at Horsemen’s Center bring the equestrian community together, and day camps offer kids a fun and safe place to go during school breaks. A year-round calendar of town-wide special events provides fun in a family environment. Events include Sunset Concert Series, the Fourth of July Freedom Festival (an old-fashioned Fourth of July celebration) and an annual Easter Egg Hunt. The department also manages 15 parks and special-use facilities throughout the town. The ski and recreation areas of Big Bear, Lake Arrowhead and Wrightwood are only an hour’s drive from Apple Valley. These resort areas offer skiing in the winter and boating and lake activities in the summer. offers an adult education program linked with Victor Valley College. For more information, visit www.avusd.org. The Lewis Center for Educational Research has been called “one of the most interesting, unique and unusual” education institutions in the nation. The school is known for its relationship with NASA and the Goldstone-Apple Valley Radio Telescope program. Among the Lewis Center’s most significant programs are: • The Academy for Academic Excellence, a K-12 charter school in which new teaching techniques and strategies are tested and refined in a standards-based educational program. The campus is located on 150 acres of Mojave river wildlands and the campus itself is an outdoor laboratory where students study ecology and wildlife. • The Norton Space and Aeronautics Academy, a K-8 charter school, is a Dual Immersion Program School with the goal of all students being able to speak, read and write in English and Spanish in all academic areas after 5 years in the program. • The Goldstone Apple Valley Radio Telescope project with NASA and the Jet Propulsion Laboratory gives teachers nationwide access via the Internet a 34-meter radio antenna that was part of NASA’s Deep Space Network. • The Local Outreach Educational Program is committed to extending the classroom to the community and beyond with local science and social studies programs, which align with the State of California Board of Education content standards. Additionally, the Lewis Center has programs in archaeology, California Gold Rush history, the solar system, solar energy and meteorology, as well as monthly observatory viewing at the optical observatory on the original campus. For more information, visit www.lewiscenter.org. PROUDLY PREPARING OUR STUDENTS FOR THEIR FUTURE. Putting learning to work, all students shall be college and career ready. ndustrious people with a strong work ethic are part of the history of Apple Valley. Farming, fruit trees and, of course, apple orchards sprung up during the 1920s. The mining industry began operation in the area at the turn of the century and continues today. Cement and limestone are the main materials supplied by local mining operations surrounding Apple Valley. Today, Apple Valley is virtually an untapped market for service and industry. 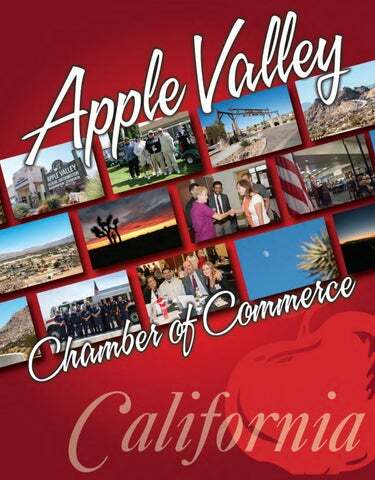 Apple Valley offers both established and new businesses an unequaled climate for success. Start-up and operating costs for new and expanding businesses are among the lowest in Southern California. Premium land sites, affordably priced land and a growing labor force of both skilled workers and professionals makes Apple Valley the perfect location for companies. has the highest estimated mean income of all the Victor Valley cities. The medical industry is also growing, and services include cardiology, radiology, oncology and pain management. Financial institutions in Apple Valley include Bank of America, Desert Community Bank, Citizens Business Bank, Washington Mutual Bank, Alaska USA Federal Credit Union and Downey Savings. Major companies to small home-based businesses make Apple Valley their home because of the potential for growth. With the population of the area estimated to be 400,000 and growing, locating your business in Apple Valley makes sense. The Town of Apple Valley continues to show steady growth in all sectors of the local economy, led by continued growth in sales, tax revenues and the singlefamily residential sector. Small apple orchards and farms were the beginning of industry here. The apple orchards are gone but growth continues in Apple Valley — the perfect place to plant your business. 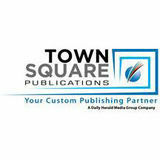 YOUR #1 STAFFING SOLUTION IN THE HIGH DESERT! Jayco Industries fabricates over a 1000 options with 25 different products lines within their 17,000 square foot, full-line factory in the North Industrial Specific Area of Apple Valley. Jayco Industries opened a second location in the San Diego area and maintains an expansive, nationwide Dealer base. Jayco Industries acquired the patent to the Armadillo Mailbox in 2013 and in 2015, ventured into a family partnership and acquired a product packaging vendor in Redlands, CA. Mechanism,” an optional upgrade that QUADRUPLES the security of your mailbox lock, an option that’s not available anywhere else! Above all, Jayco Industries continues to focus on providing the highest of quality standards and manufactures his products from 100% USA-made raw materials and labor. Jayco Industries designs, fabricates and installs high security, locking mailboxes for both residential and commercial needs. A Division of Joseph W. Brady, Inc., serving the entire High Desert region. Incorporated December 4, 1989, Mr. Brady, President and Broker is the only Commercial Broker holding the CCIM, and SIOR Designation in the entire High Desert region. The firm has closed more transactions than any other commercial brokerage firm in the last 28 1/2 years. The Bradco Companies also Publishes the Bradco High Desert Report, the only economic overview of the High Desert region since May of 1993. For a free copy please sign up at www.TheBradcoCompanies.com/Register. estled into the Sycamore Rocks at the east end of Apple Valley, Sunset Hills Memorial Park is not only one of the most scenic areas of the Valley, but it is quickly becoming a tourist destination. The cemetery’s popularity is partly due to its most famous residents, King of the Cowboys Roy Rogers and his wife, Queen of the West Dale Evans. Dale Evans so firmly believed in Sunset Hills, that she spent many hours there after the death of Roy. Dale would sit at the Rogers Family Estate Garden overlooking the valley, working on some of her many books. Shortly after the passing of Roy, Dale approached Sunset Hills founder Chet Hitt about building a chapel in honor of her late husband. Hitt responded that no tribute to Roy would be complete without mention of Dale and the idea for the Roy Rogers-Dale Evans Sunset Chapel was born. He made a promise to Dale on that day, and on Feb. 19, 2007, that promise was fulfilled. Today, the Roy Rogers-Dale Evans Sunset Chapel is a place of celebration that Dale would have been proud of. excellent medical care in Apple Valley. Area residents have access to three hospitals within a 15-minute drive — St. Joseph Health St. Mary Medical Center, Desert Valley Medical Center and Victor Valley Global Medical Center. The keystone to medical care in Apple Valley, St. Joseph Health St. Mary Medical Center, established in 1956 and is now a part of Providence Health to create the third largest health system in the nation. It’s... My Health. My Choice. Paws for Conservation Water is essential to everything that’s living, and we must be smart about how we use it. There is no shortage of ways that you can make a difference, and Liberty Utilities is here to help. Please don’t use more than you need. pple Valley was founded on a strong tradition of community spirit and the belief of neighbor helping neighbor. While this old-fashioned tradition may have died out in some communities around the country, it is still strong in Apple Valley. For those times you need to talk to a doctor and donâ&#x20AC;&#x2122;t want to leave the comfort of your own home, now thereâ&#x20AC;&#x2122;s eVisit, a new offering from St. Joseph Health, St. Mary. eVisit will connect you with a primary care physician within 10-15 minutes by phone, email, or video conference to provide a diagnosis, treatment plan, and prescriptions for many common health conditions. With affordable consultations, including the same low co-pay as office visits for in-network patients, receiving quick and convenient health care has never been easier. Get treated now at StMaryAppleValley.com/evisit or call 888-995-4913 A Ministry in the tradition of the Sisters of St. Joseph of Orange and Brothers of St. John of God.